When deep concealment is required, look no further. 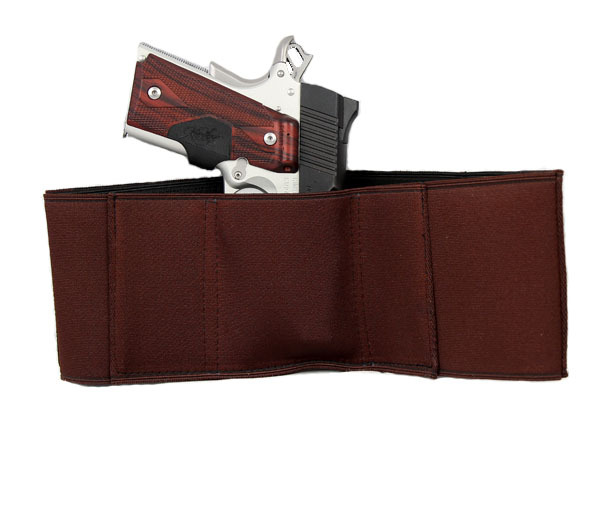 The Gould & Goodrich "Body Guard" is a waistband holster made of 4 inch wide elastic that is incredibly comfortable. Velcro makes this platform easy to take on and off whether going for a jog or simply going to the store. A perfect companion for situations in which a traditional belt or ankle holster is not possible such as jogging or deep concealment operations. Ambidextrous. Also includes one pocket for a magazine or knife, and one pocket for cuffs. Fits most medium to large autos and most small to medium revolvers such as all Glocks; Beretta 92, 96, PX4; Sig P230, P232, P250SC; HK P2000, P30; Kahr PM9, P9, K9; Walther PPK/E, PPK/S, PPK, P99; Ruger LC9, LCR, SP101, SR9, SR40, 1911; Colt Agent. Fits waists 42" - 48."